Today is Palm Sunday. Tristan thought this day was great! In Sunday School we explained to Tristan and Addi that Jesus came into Jerusalem on a donkey and was hailed by kids an grown ups shouting "Hosanna". 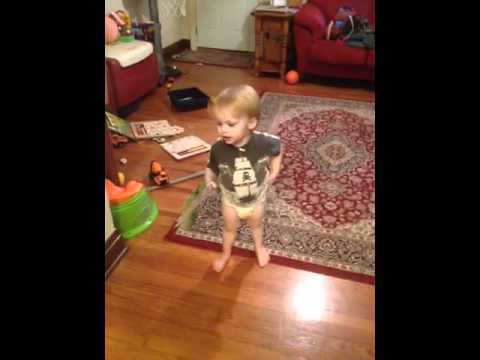 Tristan decided yelling Hosanna is AWESOME! 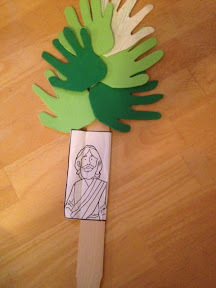 Tonight we went over the story with them again and they made palm branches. The leaves are foam cut outs of their hand prints and the stem is a paint stirrer. The opposite side of Jesus is their memory verse: "They...went out to meet [Jesus] shouting, 'Hosanna! '"~John 12:13. 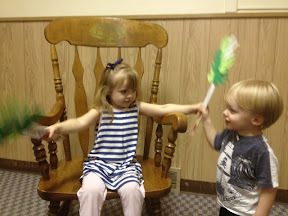 Tristan and Addi practiced saying Hosanna and waving their palm branches in the nursery, then marched upstairs to show everyone left in the sanctuary after church.